Whiteheads in Vermilion Parish – borers, rats and a Friday mystery for you. UPDATE: I didn’t get any guesses about the mowing injury, well here’s the answer – it was caused by (drumroll please) Cows! They had escaped from some nearby pasture and enjoyed munching on the edge of the rice field. Today we learned a good lesson about verifying the cause of crop damage. Fred Cramer (G&H in Gueydan) had called me about whiteheads in rice. Tiffany and I drove out to Gueydan early to beat the heat. We met with Toby McCown and Fred at the G&H store. We suspected that the whitehead damage was being caused by borers. When we struck out across the Dermacor X-100 treated field we found a few whiteheads. As we began to inspect the damaged plants, the symptoms just didn’t look like borer injury. 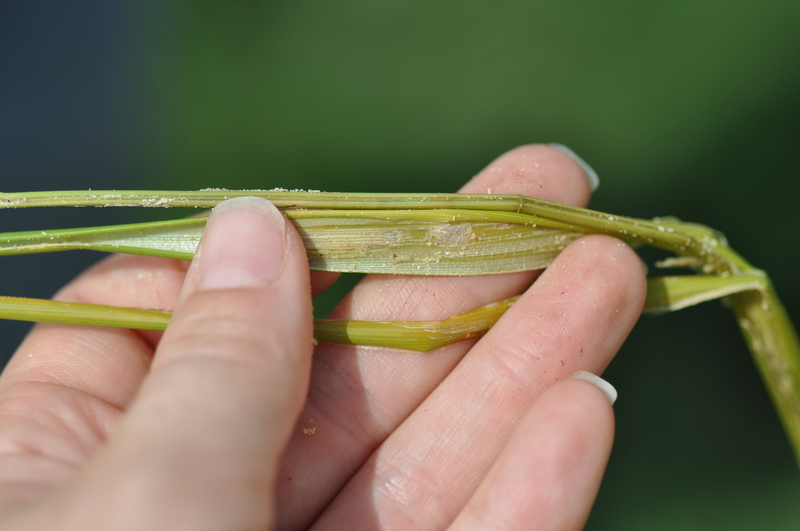 Whiteheads in rice - at first we thought these would be caused by borers, but we found that was not the cause. Feeding injury most likely caused by the rice field rat. Rat chewing injury near a node - this resulted in whiteheads. Whitehead that was most likely caused by rat feeding injury. 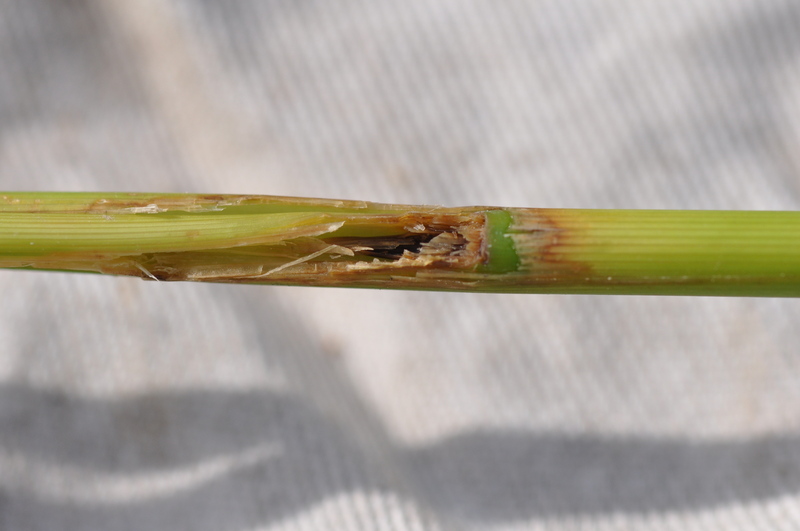 The edges of the damaged area were clean, there was no feeding lesion in the sheath or frass (insect waste), and we did not find any insects except for a few chinch bugs. It seemed like something had chewed on the rice. My instinct was to attribute the damage to either an animal or a chewing insect (maybe grasshoppers). I could not confirm what had caused this damage while I was in the field. After we wrapped up for the day, I stopped by the rice station in Crowley and showed the pictures to Johnny Saichuk – he told me the damage was probably caused by the rice field rat. He had seen this damage about 5 years ago in Acadia Parish. Apparently it is a fairly common problem in some parts of Texas. 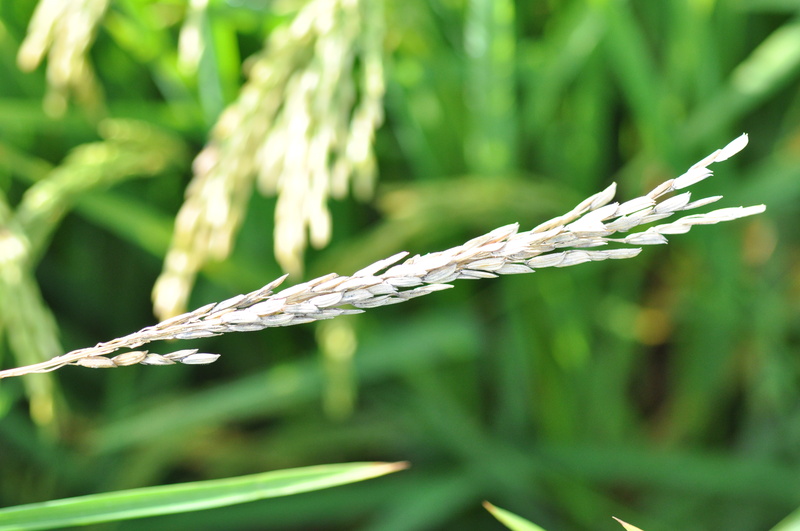 Whiteheads and some cropped rice - any guesses about what mowed the rice? We continued up the road to a nearby untreated field. Along the way, Fred pointed out a cluster of whiteheads on the edge of a field. In addition to the whiteheads, quite a bit of the rice had been clipped. Any idea what caused this damage? First clue is that it was not an insect, but something else that likes grass. The untreated field (no insecticide seed treatment) we scouted next had just started to head. 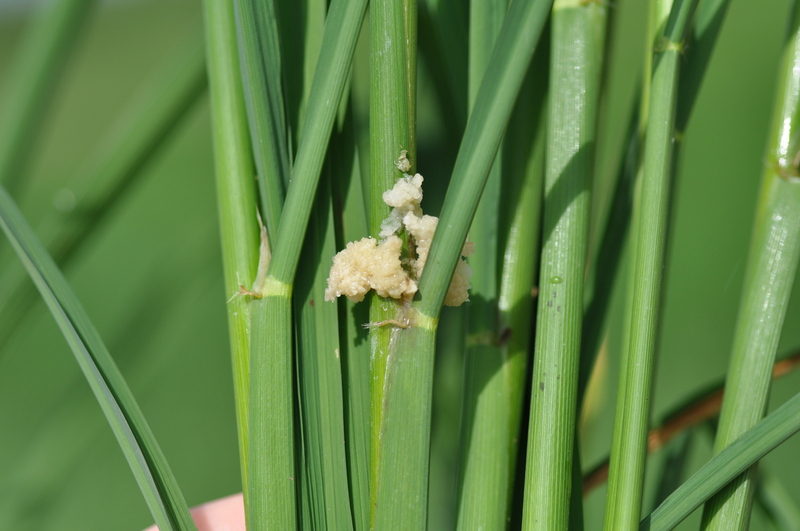 We were able to locate a few whiteheads, and upon closer inspection found some borers injuring the rice plants. 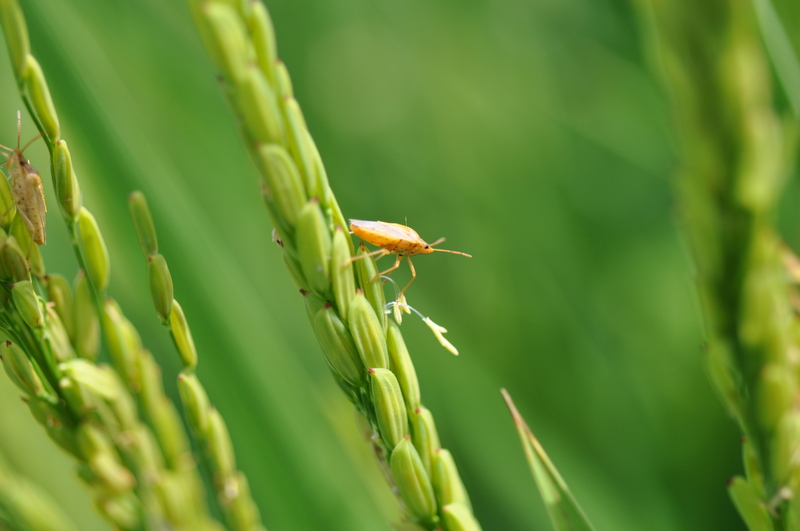 The rice is heading unevenly, and so this makes pest management more difficult – especially the timing of sprays for rice stinkbugs and borers. In one plant that had a whitehead we found a feeding lesion on the leaf sheath, and under that a tiny sugarcane borer larvae. When I cut into the stem I was surprised to find about 10 more larvae. It’s rare to find this many borers in a single stem. It was also discouraging because they were tiny larvae that had already bored into the stem. An insecticide application will not control the borers once they enter the stem. About 15% of the rice was fully headed and the rest was around split boot. We found more borers in a few other plants, and so decided that a pyrethroid spray would be wise to attempt to prevent more whitehead injury from the borer infestation. The farmer plans to apply 2.0 oz of Karate per acre. Hopefully this will prevent further borer injury and control the early stink bug infestation. I found about 10 sugarcane borer larvae had already bored inside the stem. 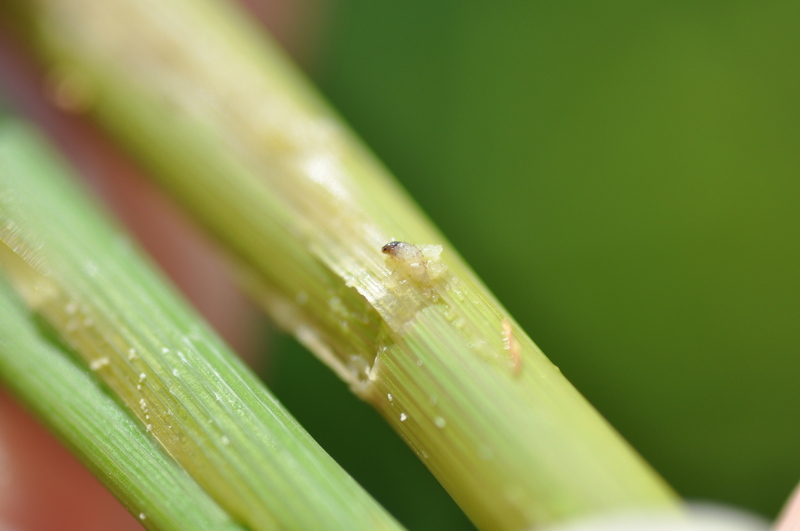 Pyrethroid sprays will not control borers that have entered the stem. In this picture you can see just how tiny these borer larvae were - they were just about 1/4 inch long and had already bored into the stem. So where did the borers come from? 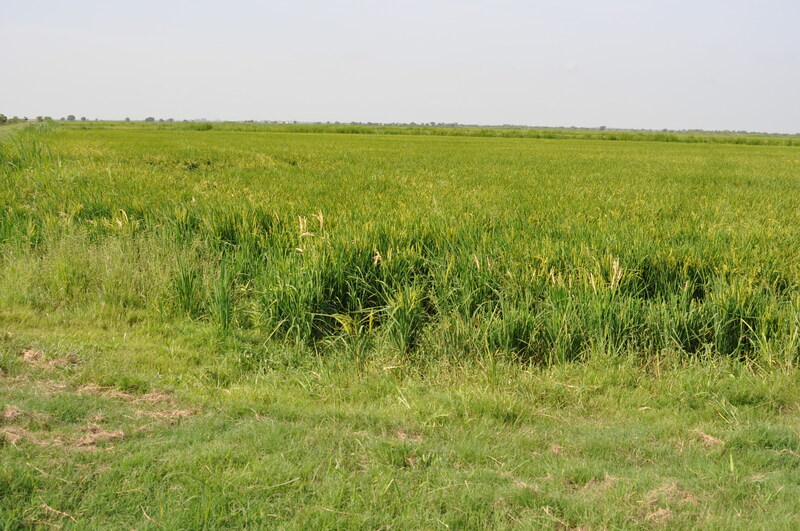 A neighboring field of tall weedy grass had been plowed under recently, and it is possible that the borers had moved out of that neighboring field into the rice. 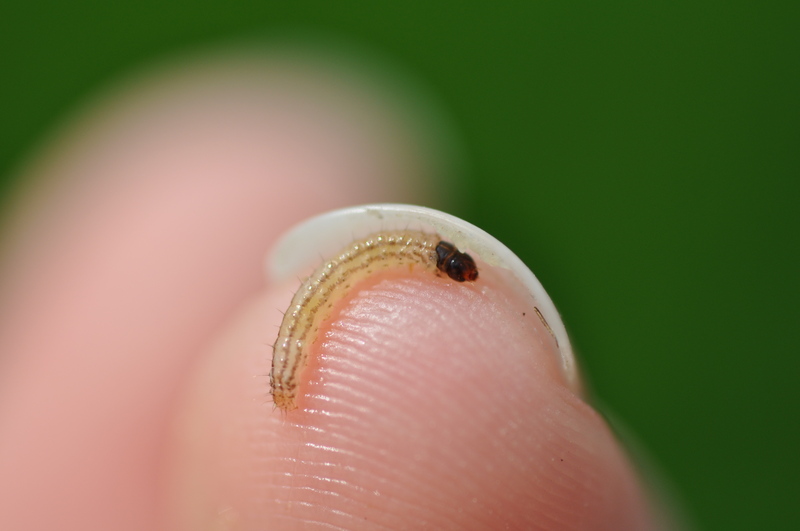 Rice Stalk borer on the tip of my finger - this larva was also small in size and had bored into the stalk. You can identify rice stalk borers by the dark head in combination with a pair of continuous stripes running the length of the body. We found some classic examples of frass bring pushed out of the stalk. 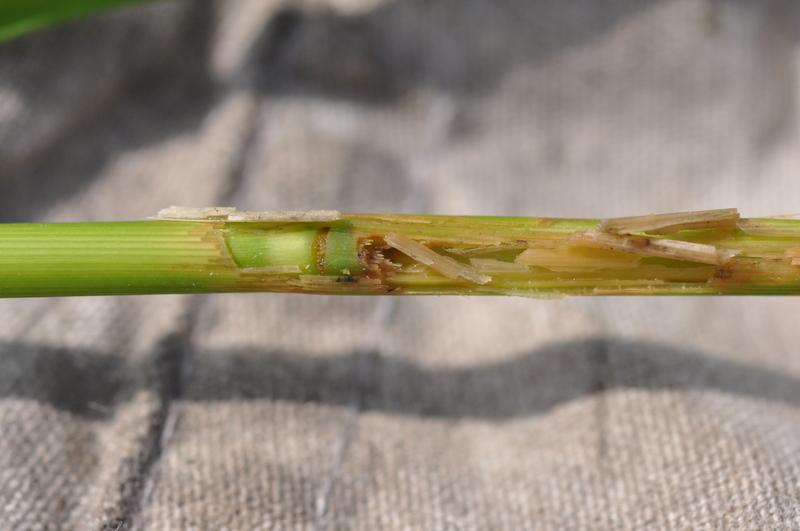 Frass forced out of the stem due to sugarcane borer feeding inside the stalk. When I pulled back the leaf sheath, the exit hole was apparent. Sugarcane borer emergence hole and frass. We also found some rice stinkbugs on the heading rice that was starting to bloom. Rice stink bug on flowering rice - these seed suckers attack rice as soon as they can. This field is also maturing unevenly, and late-season insect management will be a challenge. Remember that in most cases once you see the injury caused by borers (whiteheads) it is too late to treat. 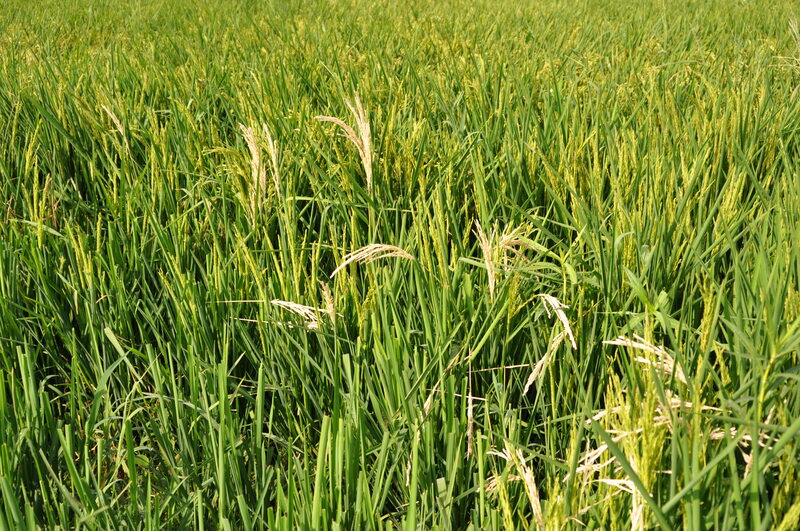 In this case the crop is maturing unevenly, so a treatment may still do some good. It is best to scout for borers when you are scouting for sheath blight injury. In Texas, the first pyrethroid application for borers is recommended from 1 to 2 inch panicle, followed by a second application at boot. The final field we scouted had been treated by CruiserMaxx. This seed treatment will not control borers, and we did find a few whiteheads in this field as well. 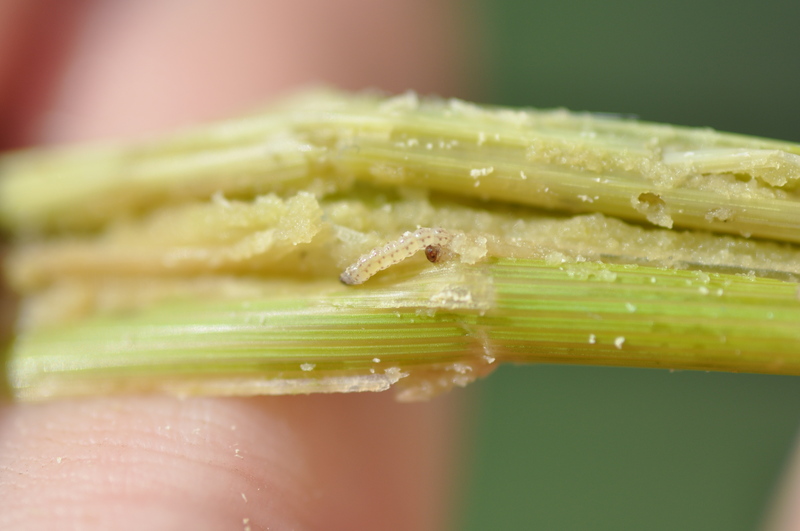 In this case we had a combination of sugarcane borers and rice stalk borers infesting the rice. The field had already been drained in preparation for harvest, and so a borer treatment is not advised. The infestation of borers was very light. Mike Stout and I are co-advising a graduate student who is focusing her studies on borers. We hope to know more about borer management, thresholds, insecticide control options, and variety susceptibility in the next couple of years.